How does Career and Life Coaching work? I coach in person at my downtown Boston office and by video chat or phone, so it’s convenient and flexible. Contact me for a phone consultation. You can tell me what you’re looking for and ask me any questions, and we’ll see if my coaching sounds like a good fit for you. While my clients often see changes rather quickly, lasting change can take time. Some clients feel complete after 3 to 6 months of coaching. Others want to continue making changes and they coach with me for longer. They’re mostly women in their 20s-40s who want more out of career and life and are ready to make progress. I also coach men, and women further along in their careers. 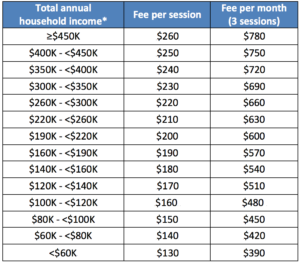 My fees for Career and Life Coaching are on a sliding scale based on total annual household income before deductions. I offer my coaching as a three-month package of 3 sessions per month, because coaching works best when people are committed to getting results. After the three months the frequency is up to you. *If someone else is paying for the coaching, the fee is based on their household income. I’d like to know more. What next? Start with a phone consultation. Get in touch! I also offer one-time Clarity Sessions–here’s more information.